When your smile GLOs, so do you. The #1 most recommended teeth whitening system by dentists, GLO puts cutting-edge whitening technology in your hands at home or on-the-go. Invented by celebrated dentist and oral health expert, Dr. Jonathan B. Levine, GLO Science is backed by 18 patents and 8 patents pending, and is a four-time recipient of the prestigious Thomas Edison Award. GLO Science is responsible for modernizing the dental practice and transforming the way patients and consumers approach oral health and teeth whitening. The only teeth whitening system that uses patented warming heat and light technology to accelerate and amplify your results. GLO puts cutting-edge whitening technology in your hands at home or on-the-go. When your smile GLOs, so do you! G.L.O. (Guided Light Optic) technology has revolutionized whitening by addressing the compromises of other whitening systems. 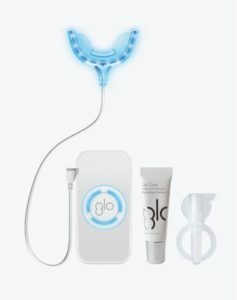 The GLO Brilliant Teeth Whitening Device, when used with the Whitening G-Vial Gels and Whitening Mouthpiece, illuminates with a brilliant blue light as it gently warms. 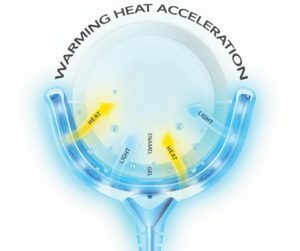 The heat accelerates the whitening gel inside the closed system mouthpiece, resulting in faster, more efficient, and longer lasting whitening without the sensitivity. It is clinically proven to whiten teeth by five shades in as little as five days with little to no sensitivity. We call this the GLO difference.